In May 1991, the mat supported jack-up rig DOLPHIN TITAN RIG 110 was wet towed across the Gulf of Mexico. During this tow, the rig encountered some heavy weather and started taking in water, resulting in a significant list. In November 1993, a motion response analysis of the rig was conducted in order to better understand the behavior of the rig in seaway. Given the calculated rig motions in combination with a relatively small freeboard, it was found that the rig's main deck frequently immerses in heavy seas. 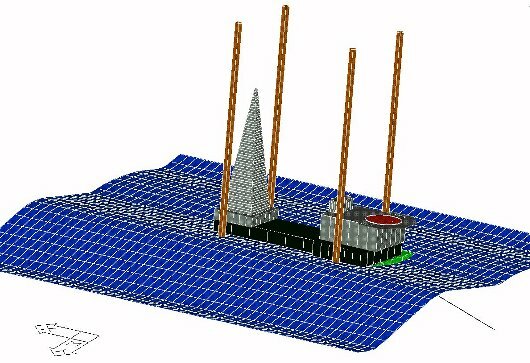 The plot above shows the rig in beam seas; the rig hull (green) is barely visibly in the wave trough. The magnitude of deck immersion was dependent on the wave heading, but no wave heading was found to be completely free of any deck immersion. The findings were reported in an Expert Witness report. Time domain analysis, showing the relationship between wave elevation and deck immersion.